Free the Rafael Nadal One! Hardhitting Novak Djokovic Serbmarined the tennis world’s No. 1 for the third straight time in a finals match this year. 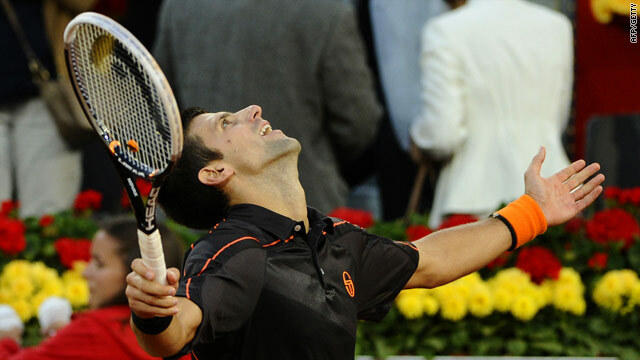 Novak Djokovic beat Rafael Nadal for the first time on clay to claim the Madrid Masters title Sunday and extend his winning streak in 2011 to 32 matches. The 7-5 6-4 straight sets victory stunned the partisan crowd in the Spanish capital as Djokovic stepped up his bid to usurp Nadal as world number one. The defeat ended a 37-match winning streak for Nadal on his favorite surface, his last coming in the fourth round of the 2009 French Open to Robin Soderling. Serbia’s Djokovic has now beaten Nadal in the last three Masters 1000 tournament finals in Indian Wells, Miami and now Madrid. Djokovic is flat-out better than Nadal right now – he hits harder, keeps Nadal on the defensive, and, most important, finally believes he can beat Nadal anytime, anyplace. From the evidence so far this year, he’s right. This entry was posted in Uncategorized and tagged Indian Wells, Madrid Open, Miami, Novak Djokovic, Rafael Nadal. Bookmark the permalink.